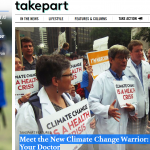 Increasingly, health is becoming part of the climate conversation. The President’s Climate Action Plan and the proposed EPA Clean Power Plan both cite health as a major reason for action. The World Health Organization convened its first global conference focused on climate and health.The latest issue of the Journal of the American Medical Association calls upon medical professionals to engage with the issue. And PHI’s Action in Climate Change and Health convening on the eve of the UN Climate Summit brought together health and public health leaders to address the connection.